With Borderless Data Roaming and the support of 1400 mobile operators in 190 countries, our M2M Hybrid SIM offers prepaid plans with two special features you’ll love – no bill shocks and no surprises – as well as other outstanding benefits such as the best global and local coverage and our GPS Backup technology that locates your device even when satellites can’t. 5 MB International Data Roaming starting at$4.90 per Month! What Else? We Have The Best Coverage Around! The best global coverage. Positioned between Satellite and traditional 2G/3G/4G Data plans, we extend mobile coverage in rural and remote areas. Our UCG8 protocol uses any available carrier for sending tracking data, whether it be voice channel, SMS, IP or other. Hybrid SIM accesses 1400 mobile networks worldwide, including those e.g. in Mongolia, Turkmensitan, Iraq, Iran, Syria, Lebanon, Angola, Namibia, Zimbabwe, Burkina Faso, Mauritania, Belize, Venezuela, Cuba, Papua New Guinea and even Marshall Islands. Only Somalia, Eriteria and North Korea are not supported! The best local coverage. M2M’s Hybrid SIM is a true roaming SIM card. It picks up the best signal from any nearby visited mobile network and registers with it. With 1400 networks to choose from, you’ll never lack coverage. Avoid Signal Loss, Even Indoors! GPS Backup included. M2M’s Hybrid SIM uses our cloud-based service to generate positioning data when standard satellite GPS fails to locate the device. This sophisticated backup positioning system known as Cell Triangulation uses publicly observable cell tower information to calculate location even indoors and in GPS-unfriendly outdoor areas. Unsurpassed connectivity. The M2M Hybrid SIM connects via direct Virtual Private Network (VPN) as well as private or shared Access Point Name (APN). It permits custom session handling, so you can manage information interchange using your own specifications if required. Low cost data plans. Specialised in M2M communication, we are uniquely positioned to offer exceptional pricing. Others charge $20 per Megabyte (yes, per Megabyte!) or more while roaming in South America, Africa and the Middle East. 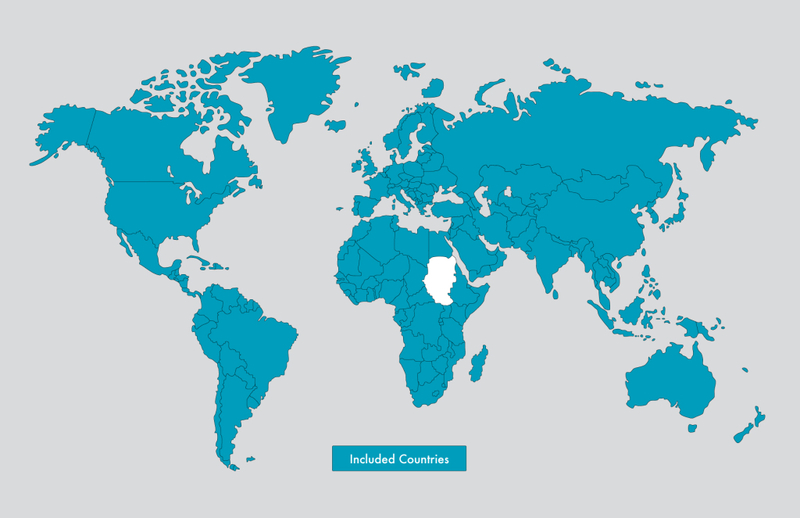 We offer affordable data bundles in those countries starting at just $4.90 per month. Unparalled global roaming. M2M Hybrid SIMs have access to more than 1400 networks worldwide and leverage the robust technology infrastructure of the key players in the global telecom industry. Our partners include Vodafone, Telefonica, Orange, Three, EE, MTN, Zain, China Unicom, MTS, Deutsche Telekom and few hundred others. Love our flat rate pricing. M2M Hybrid SIMs include borderless data roaming, GPS backup, unparalleled coverage and 25MB of international roaming at a prepaid, no surprises flat rate. This astounding set of features ensures reliable worldwide service for your M2M devices at a cost that will leave your accounting and finance department smiling. Control your operating expenses. No matter where your M2M Hybrid SIM equipped devices are, they receive high quality service at industry leading prices. While some companies charge $16.90 per MB in Angola and $13 per MB in Zimbabwe for General Packet Radio Service (GPRS), our smallest Hybrid Tariff includes a full 5MB for just $4.90 per month. No penalties. It’s prepaid. If you’re not using the SIM, our prepaid plan allows deactivation without any penalties or commercial consequences. When you need it again, just reload it and use it. A Subscriber Identity Module (SIM) card identifies a device to the mobile network using a unique 64 bit cellular user ID known as the International Mobile Subscriber Identity (IMSI). An IMSI identifies Global System for Mobile Communications (GSM) and Universal Mobile Telecommunications System (UMTS) subscribers to their mobile network. The M2M Hybrid SIM gives global data flat rate service using only a single IMSI while competitor’s offerings use multiple SIMS or dual IMSI SIM cards requiring two or more mobile subscriptions. In order to extend the value of your flat rate data allotment, the Hybrid SIM uses a unique patented technology to compress position and other data prior to transmission over the visited mobile network. This compression feature, embedded within a global data sim card that works as a local card everywhere it goes, sends data as quickly and economically as possible no matter which network service is used, whether it’s GPRS, UMTS, CDMA, LTE, SMS, or any other supported bearer service.